In my opinion, there isn’t currently a good way to evaluate team strategy in IndyCar based off of the traditional statistics of starting and finishing position. If a car improves throughout a race, was it because of good strategy, great passes, or just being fast? It’s not particularly easy to tell and even if you watch the race, there’s too many cars and different things going on to get a good measure of what happened by the eye test. The new year is right around the corner (just 78 days until St. Petersburg! ), and there’s a lot to look forward to in regards to next season. An earlier start date and later end date to the season, the 100th running of the Indianapolis 500, and the first Grand Prix of Boston, to name a few. It’s also a good time to reflect on this year as well. And being Single Seater, we’re going to take a look at the top statistics and numbers from the season. 0: What better number to start with than the points separating first and second place in the championship. Scott Dixon and Juan Pablo Montoya were tied in the points standings after a thrilling season finale in Sonoma. Montoya placed 6th in the race and Dixon won it (giving him the extra win to beat Montoya in the tiebreaker). Let’s hope next year’s championship is just as competitive as this one was. 80: The number of lead changes at Fontana this year. 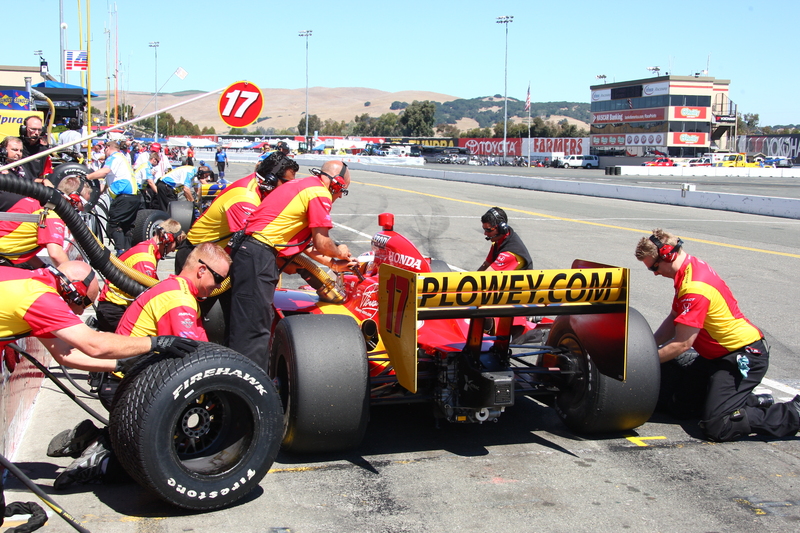 The heavily criticized event by both drivers and fans featured the most lead changes of any IndyCar or CART race there in history. Graham Rahal ended up winning the three hour epic. 5.8: This next number comes courtesy of our own statistic, R+/-. Ryan Briscoe held the highest R+/- score of any driver this season. He qualified pretty poorly in the eight races he started but was a contender for a handful of race wins. In fact, he finished higher in the championship than four drivers who completed more races than him, too — Stefano Colletti raced in 16 races to Briscoe’s 8 and was still two points shy of him in the points standings. 345: Josef Newgarden led 15.5 percent of the 2,232 laps run this year, the most of any driver. The bulk of these laps came at Milwaukee and Iowa where he led over 100 laps each. He was only able to muster seventh place in the points though. Three DNFs and two more 20+ place finishes kept Newgarden from competing for the championship later into the season. Newgarden prevailed as one of the most promising young drivers this season and will surely shine again in 2016. $3,526,100: The winnings Montoya will take home, according to Racing Reference, simply from race performances alone. This is the most of any driver, largely due to Montoya’s Indianapolis 500 win which netted him $2.5 million. Must be nice. Here’s to a great 2015 season and an even better 2016! What it is – sDRS is loosely based on the Elo Rating system, but has some major differences to account for the multiple competitors in motorsport racing. The system tells us how strong a particular driver is during a season and how close the competition is to each other. It can be used to predict which driver will be the strongest heading into a race and also accounts for past year’s performance. The nature of this scoring means that the system, like Elo, is zero sum. This means for every point one driver loses, another one gains. This serves to keep the system balanced and easy to judge throughout seasons, no matter the scoring system in use. sDRS is also a much better predictor for mid to back field drivers who don’t get much love from Formula One’s top ten scoring system. It can show the best of the rest just as easily as it can show the best overall. sDRS rewards consistency over one off races, too. A driver may get a big jump in points for a good result one week, but if he doesn’t back it up after that, his rating will fall back down. This avoids a major pitfall of Formula One scoring in that one driver could get a lucky result and sit in a good points position all year long. A driver will always gain points for being better than average (tenth or eleventh place), and always lose points for a result worse than average. Speaking of average, the majority of the field will have an sDRS score of 1400-1700. 1500 is considered an average driver, less than 1400 is a bad driver (worthy candidate for replacement next season in most cases), and greater than 1700 is a great driver. A score above 1850 is the sign of a world class driver. At the end of each season, driver’s scores are reverted to the mean by one half. This accounts for the unpredictability of car performance each year. With car redevelopment each season, it’s highly likely that a team who was successful one season could be well of the pace this year. Reverting to the mean corrects for this and makes the ratings more accurate at the start of a season. Think McLaren from 2014 to 2015. Telling the relative strength of the field for a given season is a strength of sDRS. The point spread between the lowest and highest rated drivers tells us how closely matched the field is. A spread of less than 200 points is incredibly close and usually doesn’t occur in Formula One. 300-400 points is what an average Formula One field looks like and more than 500 usually means there is a powerhouse team dominating most of the season. Drawbacks – Like any rating system, sDRS is not perfect and has its quirks. For starters, sDRS doesn’t know which track the series is going to next or how many races a driver has competed in. So for example, a driver’s great historical record at a track isn’t accounted for in the calculations before that race. All sDRS knows is that a driver has been good, bad, or average this year. The second problem is that new drivers will usually have unpredictable ratings for the first five races of the season. It takes sDRS a few races to center in on their real score and see if their early results were a fluke or a sign of things to come. It’s a simple rating system, meaning it uses very limited variables to give a score. This is beneficial in a lot of cases as the more saturated a predictive statistic becomes the more likely it is to fall victim to too much noise – which screws up the data. sDRS does a great job of showing the strength of drivers relative to each other, but shouldn’t be used as an all or nothing guide by any means. Ratings will be updated after each week of the Formula One season. Each week, we take a look at our most popular articles and stories from around the web and put them into one post. Some of them will be data based and some will be just interesting or important news stories in the racing world. This is the Weekly Report. Excerpt: Max Verstappen will become the youngest driver to take part in a Formula One weekend when he takes the wheel of a Toro Rosso in Friday first practice, three days after his 17th birthday. Note: If you have an article you think should make it into the Weekly Report next week, let us know by sending it in through the form on the contact page. We’ll take a look at it and perhaps put it in next weeks edition!